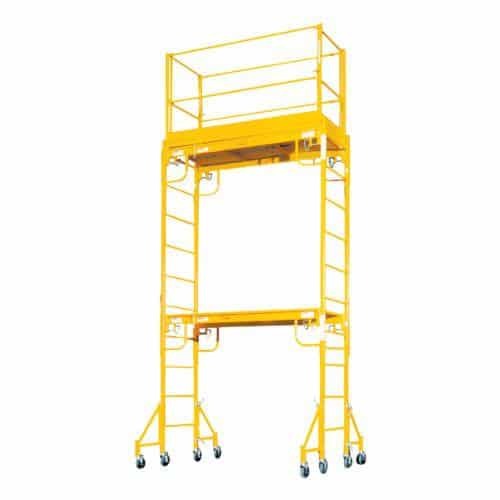 This scaffold has a standing platform of 6′ x 30″ and has a max standing height of 6′ per section, adjustable at 2.5″ increments. Up to two sections can be stacked to give a max platform height of 12′. This scaffold can be used on stairways which are at least 32″ wide and can give a standing platform of up to 6′ tall per section measured from the lowest stair that the scaffold is set up on. 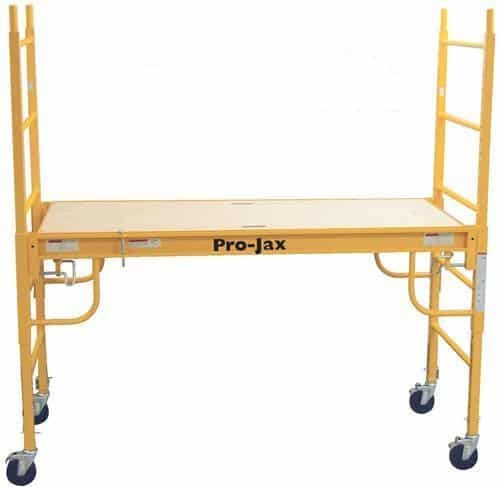 We include casters, safety rails, and/or outriggers (when stacking two sections) for added safety at no additional charge. This scaffolding is for indoor use only. SKU: QAC01. Categories: Tools & Equipment, Painting & Drywall Equipment. 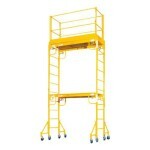 Tags: painters scaffold, scaffold, stairway ladder, stairway scaffold. This versatile aluminum articulated ladder has a Type 1A 300 pound duty rating and a three-position Multi-Lok hinge to allow for 18 positions or applications including: Double stepladder, stepladder, stairwell ladder, stand-off ladder, fully extended straight ladder, 1/2 and 3/4 length straight ladder, self-supporting scaffold, extended span scaffold, stairwell scaffold and others. This step ladder will give you a safe standing height of 10′ off the ground (plus the height of the person using the ladder), is a class 1A fiberglass ladder, and will support up to 300 pounds. This ladder can only be climbed on one side. This heavy-duty aluminum 5-way combination ladder has a 300 pound duty rating (Type IA) per side. The ladder is extremely versatile as it can be easily converted into five different positions: a stairway ladder, two single ladders, extension ladder, stepladder, or double stepladder. It has a 13.5-foot maximum working height and a convenient folding Spill-Proof pail shelf. This step ladder will give you a safe standing height of 8′ off the ground (plus the height of the person using the ladder), is a class 1A fiberglass ladder, and will support up to 300 pounds. This ladder can only be climbed on one side.